Six Weeks in Africa is a nonfiction collection of travel memoirs written by Grahame Elson. Elson and his partner travelled throughout Africa in a series of week-long adventures. They carefully planned much of their trips beforehand, including the hotels and tour packages they’d be using. Elson describes each of these adventures in some detail, including the history of each place as well as any religious movements, artistic and cultural scenes, and the environment. He begins with Egypt, which they visited on three different occasions between 2001 and 2008, and shares their experiences cruising down the Nile and visiting Luxor, Cairo and the Valley of the Kings, and he goes into some detail about Howard Carter’s discovery of the tomb of Tutankhamen, and the curse that seemed to follow all who were involved. The second focus of their travels is Tunisia in North Africa during which they explored the thousand miles of Mediterranean coast before experiencing the salt flats of the Sahara. Their trip to Morocco saw them reveling in the sun and sand of Agadir, and Kenya took them south of the equator and into lion country. 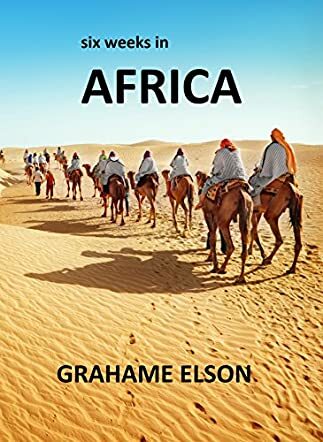 Grahame Elson’s Six Weeks in Africa is an engaging and informative look at the countries he and Shaun have visited, but it’s really much more than that. Elson has a gift for making the history of each place come to life, including the mythology and magic of antiquity, as well as the impact of imperialism by the Romans and by Europeans during the nineteenth and twentieth centuries. He gives the reader a lot to think about, and he does so in a style that’s conversational and often humorous in tone. Elson doesn’t take himself too seriously and his candor and ability to laugh at himself make this memoir work quite well. I loved learning about those places he explored and felt as though I were experiencing them through his eyes -- and I definitely envied him those endless beaches and warm oceans. Elson’s insights into each country and the political and cultural upheavals of the past and present are illuminating, and I was particularly moved by the fact that many of the places he had visited have changed profoundly since their visit and are no longer safe for visitors. Six Weeks in Africa is a marvelous tour of Africa hosted by a knowledgeable and entertaining host. It’s most highly recommended.